On November 18, a chilly Saturday morning, eight of us carpooled up to the First Congregational Church in Lynnfield, MA, to hear Dr. Mary Luti’s fascinating and dynamic talk on “Conscience and Credit Cards, Rockstars and Revolution: Living with the Reformation Today.” A long-time educator (retired from Andover-Newton Seminary), pastor, author, and former Catholic nun, Luti has an immensely broad perspective, and her talk was riveting. 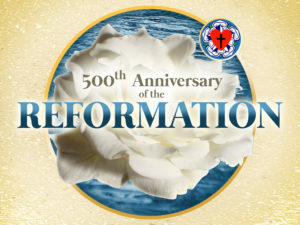 She discussed in depth many aspects of Martin Luther and the Reformation he catalyzed— including its three bedrock principles of “sola scriptura,” lay ministry (the idea that all people of faith are ministers), and the authority of individual conscience—and how the influence of the Reformation has pervaded Western culture through the centuries to today. Dr. Luti is an energetic and passionate speaker demonstrated by the fact that she lectured for about three and a half hours and everyone remained riveted. Occasionally during the lecture we divided into small groups to discuss themes she had highlighted. What an amazing morning! Don’t feel bad if you missed it – there is a digital recording of it that will soon be up on the Metropolitan Boston Association website. Learn more about Dr. Luti here.